"Try this, you'll hate it," someone wrote to me in an email yesterday. It was the new song from a band called Black Cards, who are fronted by the improbably-named Bebe Rexha and Pete Wentz. 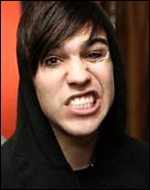 Yes, that Pete Wentz. From Fall Out Boy. With the daft hair and the permanently black wardrobe. Married to Ashlee Simpson. Wrote "This ain't a scene, it's a goddamn arseface". Picture at the top of this post. Him. So, yes, I was predisposed to hate this new song, Dr Jekyll and Mr Fame. The lyrics appear to be about - YAWN - the dark side of celebrity. Worse still, the band's Wikipedia entry insists they are trying to fuse reggae and electro-pop: The two most misrepresented, misunderstood, and deceptively complex genres in the history of music. And yet... The tracks on the band's MySpace / YouTube / Facebook web presence are surprisingly good. I'm not sure where the reggae comes in, but the quartet have stumbled on a big-hearted, bouncy, pop groove and Bebe Rexha (23 points in Scrabble) has a pleasingly seductive purr to her voice. Wentz even gives a little tip of the hat to Abba's Gimme, Gimme, Gimme (A Man After Midnight) on the keyboards. You can download this single if you "like" the band's Facebook profile (if there is a sentence in the English language more vile than the last one, I have yet to hear it).